The most beloved instrument in Greece is perhaps the only that has minimal, mainly aesthetic, differences from his ancient ancestor, the Pandoura. 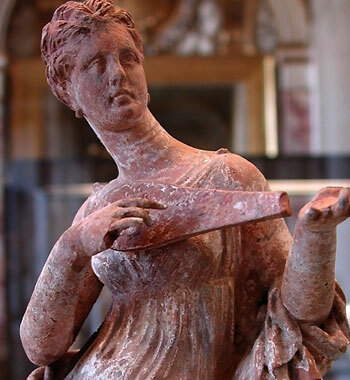 Simultaneously it is the only instrument, based in this origin that divided the Hellenism from the antiquity. As almost all the researchers contribute, the fate of the Trichordo-Three stringed, or Pandoura, or Tamboura, later in the east Saz and finally Bouzouki, resembles as a continuous transfer between Greece and East. Already from the ancient years, is recognized by everyone the import of Pandoura from the East, an instrument with a round belly, arm of double length and three double strings with the same precisely relation that is also used in the exachordo-tree double stringed bouzouki. The big success of Pandoura is owed in the possibility of production of big wealth of sounds with a small number of strings. In the Byzantine Years, it resembles it conquers some impression and in the orders of Scholars is advisable (with the kanonaki) instrument for the teaching of Byzantine music, while richly is also the depiction of taboura. Of course, despite the mistaken conviction that the name bouzouki is presented together, already by the Byzantine years is observed the parallel use of term with the ancient Tamboura, Thambourin and Pandoura. The bouzouki belongs in the family of instruments with long neck, like the Saz, the Tamboura etc. The name Bouzouki its believed that it emanates from the word Bozouk that means broken obviously in the change that came to the instrument from the Eastern and Central Asia. At the duration of the exchange of populations between Turkey and Greece (1919-1922), the bouzouki makes its appearance in Greece. The Greek refugees brought with them the Smyrneika (songs), in which they played the Al Oud or Outi as they used to call it. The outi-oud was quickly replaced by the bouzouki and the Smyrneika influenced the rebetiko. Thus in the dues of decade 1920, afterwards the national completion (via the Mikrasiatiki destruction) will be presented also the first bouzouki orchestras. 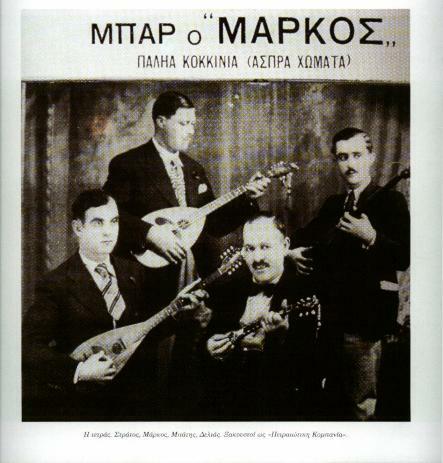 First and legendary the Tetras the famous of Piraeus, that founds the M. Vamvakaris in 1929 with three bouzoukis (Vamvakaris, Delias and Pagioumtzis) and a baglama (Mpatis). The bouzouki becomes henceforth the king of the popular orchestra. The fourth pair of strings that Manolis Chiotis adds immediately afterwards the war is the more important perhaps change in the form of the bouzouki in the 2300 years of its Greek history. A change that in a critical turning-point of its course offered him new, enormous, expressive possibilities and rendered it the absolute sovereign of the Greek music. What really happened in the dues of 19th c. is the withdrawal of the bouzouki from the classic popular orchestras. That season, finally henceforth, two popular orchestras are formed: the kompania in main Greece (clarinet, violin, lute-laouto, santouri) and the zygia in the islands (violin-lute, lyra-lute). Here precisely are found the roots of its new acme. The bouzouki (name that dominates henceforth against tampoura) becomes a sovereign instrument of the solitary songwriters, and not of the professionals musicians. The instrument of the Rebetiko players-Rebetes! The bouzouki is a string voice instrument that emanated from taboura, with successive differentiations, so that are satisfied the needs for a loud and bright sound. Is constituted from a half sphere belly and arm of double length, and has total length from 70 cm (27,56 in) up to 1 metre (3.28 feet). The arm has stable freats with a half tone steps and T type keys. The progressive reduction of the number of the strings, the elevation and the extension of the freatboard on the top-cover, with simultaneous increase of the height of the bridge, constituted the first points of the differentiation between this new instrument and the taboura. These characteristics existed already in a mature descendant, the mandolin, and it was easy to be transferred from this to taboura. After a short time this new instrument selected for its belly the lute’s-laouto’s, because it offered a safety in the high tendencies and tunings of the steel strings. Stable metal freats replace the mobile (animal gut) and mechanic keys are placed instead of the wooden. In that form the bouzouki can be considered as a constructional and soundly mature instrument, with a wide acceptance and an increasing popularity in the musicians and the popular layers dues of the 19th- beginnings of the 20th century. Apart of all these, differentiations begin to appear in the form of its resonator-belly. The place and time of the realisation of these changes can be considered unexpected. U.S.A dues of 19th century. Immigrants and cultures of various nationalities continue coming in intermarriage from each other, in a fight for survival and creation. A Greek manufacture of instruments Anastasios Stathopoulos founds a handicraft of musical instruments, in order to satisfy initially the needs of the Greek community. An important manufacture in this handicraft is the Italian Henry Capielo. The result of this collaboration is the “Stathopoulos” bouzouki. Such bouzouki’s take the boat of return for Greece where they will put the first sperms of change. The changes in its form will be accelerated considerably, while the laouto shaped bouzouki will suffer of persecution by the dictatorship of Metaxa. The bouzouki will take again elements from the mandolin, in order to transform its resonator and looks like a mandola, so it won’t get noticed from its persecutors. This change did not trouble much the musicians because they were absolutely familiarized with the instruments that belonged in the family of the mandolin. A lot of mandolins and mandolas at that time, went to the manufasture bench , so that there are transformed in bouzouki’s and half bouzouki’s, a process that is continued up to today us habit. Vasilis Tsitsanis, contributed decisively in the promotion of this “new” instrument. His first instrument was a mandola. The mature bouzouki has very little resembles with the “primitive” new instrument of the 19th century. Afterwards the Second World War started to appear the first tetrachorda-four stringed bouzouki’s with tuning DO-FA-LA-RE/C-F-A-D (again per pair). It is said that the first that added the fourth string was Stefanakis while other disagree saying that it was Anastasios Stathopoylos or Manolis Chiotis guitarist. 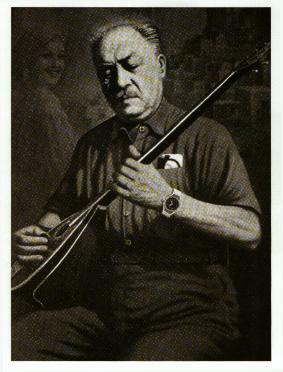 Chiotis however was the one that made the bouzouki known and particularly loved because he introduced and played it in front of the former King of Greece. 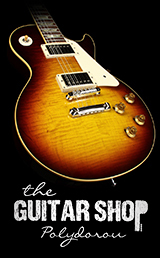 The addition of the forth pair of strings, and the change of the tuning in one tone lower than the guitar will give a new musical instrument. This change will attract a line of constructional changes (increase of dimensions of the top and the freatboard). Handmade pick-ups “strengthen” its sound. Tsoliadakia, parthenons and gardens from synthetic perl, are used as decorative elements for its top. This new hybrid will suffer of hard criticism from musicians and critics, but apart of all these its contribution in the Modern Greek music it can be ignored. It is played with a pick that initially was wooden (from cherry tree) or from turtle shell and henceforth synthetic. 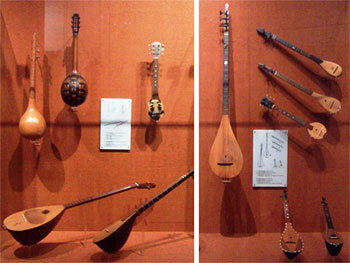 Baglamas and Tzouras from the other hand are small instruments with long neck and emanate from the bouzouki. 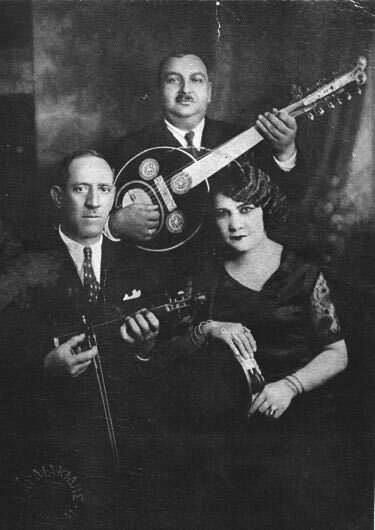 These 3 instruments together supplement a formal orchestra of Rebetiko music. Tzouras resembles a lot to the bouzouki. Their basic difference is the size. The neck and the lid-cover are smaller and that results the deep sound of this instrument. Also it is tuned D-A-D, while smaller tzouras is tuned G-D-G. The Baglamas is the smaller instrument of the 3. It has 3 double strings and it is tuned an octave higher from the bouzouki. It was created when the Rebetes-Rebetico music players were chased from the Authorities because their music was forbidden. Baglamas is known also as the bouzouki of the prison, when Rebetes prisoners started to make bouzouki’s so small in order to be able to hide them easily in their shells. The body can be constructed from turtle shell, pumpkin or from one piece of engraved wood. It is an easy instrument that in the past time older was often also used as the main instrument in small feasts.